It is fair to say that Anna Calvi has probably not had one of the most orthodox routes to International stardom. It is also somewhat unusual that many of her biographies refer to her experiences before she was four years old. However, the fact that she was seriously ill and subject to extensive surgery must surely have had an impact on her view of the world and have influenced the dark and powerful sound which is present throughout her music. The diverse range of her music must also be partly credited to her music loving father who apparently exposed her to a wide and eclectic range of bands. Perhaps even more surprisingly, she was not a natural vocalist. In fact, she only really began singing in her mid twenties. She certainly made up for time by releasing a self titled debut album which gained both commercial and critical success. This included nominations in The Best British Breakthrough category at the BRIT Awards in 2012. Like any artist who attracts this level of success, especially when they appear to suddenly burst on to the scene, this next release is bound to be met with a sense of serious expectation. Having established a reputation as a unique and challenging artist, "One Breath" will be expected to reach the artistic heights of her debut. The opening track, "Suddenly" is on it's own a very good introduction to this album as it incorporates many of the themes and styles present in many of the tracks. It starts off broody and mysterious. It is very cinematic with Anna Calvi's powerful voice taking centre stage until eventually the sound builds in to a triumphant noise mid way through the song. It is followed by "Eliza" which will already be known to a lot of people as it is the lead single and has received a fair amount of radio air time. It was a good single choice as it maintains the orchestral theme to the album but has a more warm tone to the overall sound. In contrast, "Cry" starts with a very similar style but with a much starker sound. "Piece By Piece" sees a distinctive change in sound where this song has more electronic beats and a more 'twisted' appeal. Again it is her pure and piercing voice which shines against the sparse background. On "Sing To Me" you find a highly emotive song which builds slowly and patiently to a more lush, orchestral peak. It brings images of a slowly building sun rise to mind. A technique which is used to similar effect on "Bleed Into Me" but again there is a more fragile sound that is juxtaposed against that powerful voice which really punctuates the lyrics. A potential future contender for a single must be "Tristan", as it has a more upbeat sound compared to the other tracks. It actually sounds very much like an Amanda Palmer song. It is a more 'catchy' song then the others but it is delivered with an off kilter passion.The important thing about Anna Calvi, however, is that there is never a sense of being alternative or different just for effect. Her willingness to offer something beyond the run of the mill is clearly a genuine calling. The comparison to Amanda Palmer is also evident on "Love Of My Life" which has a 'grungy' sound but against a more aggressive vocal approach. 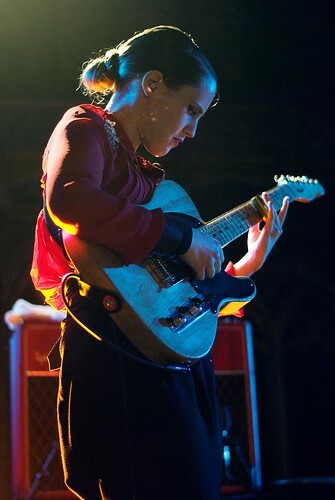 Given her dramatic approach to her music you could certainly see Anna Calvi being a positive artistic focal point who will generate similar levels of adulation and worship from her fans. The title track, "One Breath", with it's refrain of "one second to live" is not surprisingly another intense and passionate song. On this song, the emotion culminates at the end of the song in a dramatic string section. Whilst "Carry Me Over" opens up with a sound that is reminiscent of the opening to The Stones' "Gimme Shelter". Like that song, it has gothic undertones but this builds in to what sounds like a romantic track. That is at least until half way through where there is a shift again to electronic beats and an almost trance like feel until it blooms in to a softer, wider sound. The final track is "The Bridge" which opens up with a choir effect and the entire song has the feel of a hymn to it. As already highlighted, Anna Calvi certainly has the qualities to develop a passionate and loyal fan base who will worship all she does and this album will only further enhance this. This last song is one of an understated strength and quiet confidence as it draws the album to a conclusion. When listening to Anna Calvi's music it is hard not to use terms such as cinematic, orchestral and dramatic as they apply so appropriately to many tracks on this album. It is, however, an album which is certainly expansive and manages to seemingly effortlessly move from a sparse and emotive sound to a feeling of pain and passion. Many of the songs build and build like an epic thunderstorm. It's release date is perfectly timed for the autumn and winter, as it is an album to be played under dark clouds as rain falls on the window whilst you seek solace inside.